Alma is raised by her mother Odelia who passes on her ingrained hatred of being dark-skinned. Alma complains about being fat and big, but even in childhood Eugene is attracted to her. Eugene grows up being hated for his light-skin by many dark-skinned people–including his own father; he is seen as privileged although he never considers his skin color a privilege. Eugene and Alma form a bond from childhood that moves from friends to lovers as they try to evade the hatred that surrounds their families and their town. However, when they confront their past, it besieges them and leaves them incapacitated. All of the characters (including the parents and friends) are voiced through Joe Wilson, Jr. and Rachel Christopher’s masterful performances. With the exception of a few minor costume changes, the actors are onstage moving and telling their story for the entire show (with no intermission). They move and speak with rhythm, emotion, and character. Wilson, Jr. and Christopher’s performance create a piece of art that becomes flesh and bone. 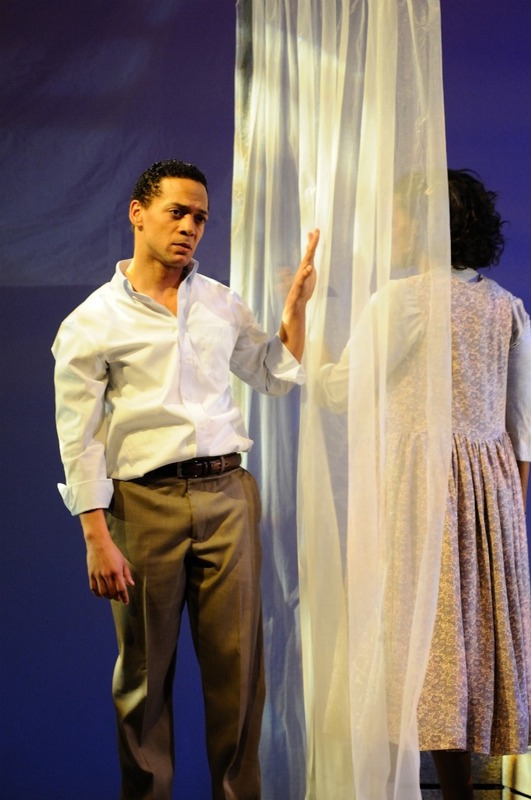 The scenery, designed by Seitu Jones, provides a sparse, yet powerful canvas. The lighting, by Michael Wangen, accents the mood and tone of each scene; combined with the sound design of Peter Sasha Horowitz, the visceral quality of the production is felt to the core. The overall production ensures that the audience will be immersed in the sights, sounds, and textures of Alma and Eugene’s lives. The actors conceive a world that–although perceived artistically–is a very realistic portrait of the hidden faces of racism. TNETG. 3/5/11. This entry was posted in Drama and tagged April, dramatic movement, hatred, Joe Wilson Jr., Laurie Carlos, love, lyrical, March, Michael Wangen, Peter Sasha Hurowitz, poetry, Professional, Providence, Rachel Christopher, racism, RI, romeo and juliet, Seitu Jones, tragedy, Trinity Rep, Yellowman by beccackidwell. Bookmark the permalink.